Anyone who thinks the legal arguments behind Obama’s immigration order are radical hasn’t read them yet. 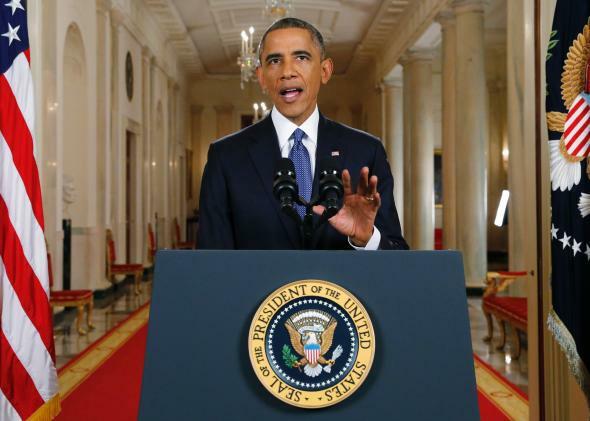 The underpinnings of the president’s immigration plan are anything but radical. President Obama announces executive actions on U.S. immigration policy at the White House on Nov. 20, 2014. Despite howls of protest, Obama’s actions are, if anything, legally conservative. The idea that the immigration plan just announced by President Obama is a lawless power grab is absurd. As the Justice Department legal analysis that was just released amply demonstrates, much of the advance criticism of the president’s action has been uninformed and unwarranted. The opinion is well-reasoned and at times even conservative. The president is not acting unilaterally, but pursuant to his statutory authority. Wide discretion over deportation priorities has long been conferred on the executive branch by Congress, and it is being exercised in this case consistent with policies such as family unification that have been endorsed by Congress. Let’s be clear about what the administration has not done in this opinion. No one has been granted “amnesty,” either literally or functionally. And no precedent has been set for this or any future president to act unilaterally in disregard of acts of Congress. On the contrary, the legal opinion rejects a second proposed exercise of discretion—deferring deportation of the parents of “Dreamers”—that Justice concluded cannot be said to carry out priorities established by Congress. The fundamental fact is this: There are 11.3 million people in the United States who, for one reason or another, are deportable. The largest number that can be deported in any year under the resources provided by Congress is somewhere around 400,000. Congress has recognized this and in 6 U.S.C. 202 (5) it has directed the secretary of homeland security to establish “national immigration enforcement policies and priorities.” In the action announced tonight, the secretary has done just that, and the president has approved. Under this order, Homeland Security will give priority to deporting those who are threats to national security, border security, or public safety, including those who have committed serious misdemeanors or abused the visa process. Obviously, no one will criticize that sensible setting of priorities. What has provoked vociferous criticism is the affirmative decision to announce a deferral of deportation for parents of those who are in the country lawfully. That is a lot of folks: Probably about 4 million people will be eligible to apply. Concededly, such a sweeping action is not usually thought of as a mere instance of individualized “prosecutorial discretion.” But the executive branch is entitled to act on the basis of large policy considerations, and not simply on the basis of case-by-case determinations. And in many instances that discretion has been exercised in broad strokes. The number of people who will benefit from deferred immigration action is dwarfed by the tens of millions who benefit from the discretion exercised by a series of administration decisions not to investigate and prosecute most violations of federal laws prohibiting possession of marijuana. Perhaps what has understandably concerned critics most is not merely the deferral of deportation proceedings but the affirmative step of permitting those whose deportation is deferred to then apply for authorization to work while they remain in the United States. But here the president is not acting unilaterally nor even on the basis of an inferred discretion. He is, rather, acting on the basis of specific statutory authority from the Immigration and Nationality Act. Under that authority and by pre-existing regulation, the secretary of homeland security is authorized to grant authorization to work to those who are in the “deferred action” category. If Congress does not want those whose deportation is to be deferred to be able to work lawfully, it can certainly repeal this regulatory authority. But it has not done so, and for good reason: Those who are able to demonstrate economic necessity to work will undergo background checks and pay local, state, and federal taxes, something a lot of Americans support. The lawyers here were cautious. They gave approval for deferred actions for parents of citizens and lawful permanent residents, finding that Congress had demonstrated support for permitting people who are lawfully in America to be united with their parents, spouses, and children. They did not, however, believe that they could approve a similar program for parents of those who are in the United States under the deferred action for childhood arrivals, or DACA, program. Because the Dreamers remain in the country based on discretion, not on the basis of a legal entitlement, OLC reasoned that without a family member with lawful status in the United States, there was not the same grounding in congressional policy to justify classwide relief. Ironically, if anything could be criticized in the administration’s legal opinion, it would be that the reasoning for not permitting deferred action for Dreamer parents is somewhat thin. At the end of the day, the legal concern seems to be that approving deferral in the case of Dreamer parents would suggest the absence of a limiting principle: If relatives of children who are not themselves lawful residents are permitted temporarily to remain, what about relatives of relatives of relatives? The program approved by Justice is more soundly grounded in a family connection with a child who is a citizen or a lawful permanent resident. The president is not acting contrary to any statutory mandate. Nothing in the president’s action sets a precedent for unbridled executive action (as Marty Lederman sets out in a post for Balkinization). To note one example, although a president can cut back on enforcement of tax laws, no president can relieve any one American of a statutory obligation to pay taxes. The next president can come collecting—and interest and penalties will be accruing until he or she does. In this case, the full amount of funds for deportation will continue to be spent in accord with enforcement priorities set by Homeland Security that are fully within the discretion conferred by acts of Congress. The scope of the relief is comparable to that granted without significant controversy by the first President Bush to 1.5 million undocumented aliens. In light of how legally conservative the opinion really is, it is a wonder that this issue has become the subject of such heated, occasionally apocalyptic commentary in the days leading up to Thursday night’s announcement. Those who object to the president’s efforts to unite families should stop hiding behind unfounded legal alarums and debate the president’s actions on the merits.